voted in favour, 10 voted against, while two cast blank ballots. approved direct rule in Catalonia, allowing Madrid to directly administer the breakaway region. Two right-wing parties, Citizens (Cs) and People’s Party (PP), along with the centre-left Socialist Party of Catalonia (PSC), left the Catalan parliament before the vote in protest. Alberto Rivera, president of Cs, took to Twitter to call the vote “illegal”. Miguel Iceta of the PSC said it was a “spectacular error”. “We take this step on our feet, with our heads held high. Not on our knees like subjects, but as free people without fear,” he said. Reactions to the Catalan declaration have mostly called for dialogue to resolve the impending crisis. Donald Tusk, president of the European Council, said he hopes the government in Madrid doesn’t result to force. Charles Michel, prime minister of Belgium, echoed Tusk’s call for dialogue and said it is the only way to resolve a political crisis. 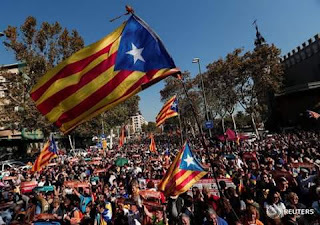 “Catalonia is an integral part of Spain, and the United States supports the Spanish government’s constitutional measures to keep Spain strong and united,” State Department spokeswoman Heather Nauert said.